PTA members from North Carolina traveled to Washington D.C. in March for the PTA Legislative Conference. NCPTA caught up with a few volunteers along the way while visiting leaders on Capitol Hill, and they agreed to share photos and comments about their experience. 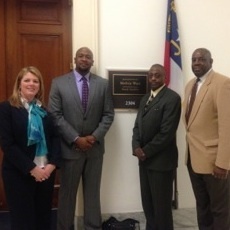 Susan Wallace (far left) and Donald Dunn (far right), board members of NCPTA, along with Kevin Weston, PTA member from Fayetteville and Domonique Tilman, a representative from Congressman Melvin Watt’s office.